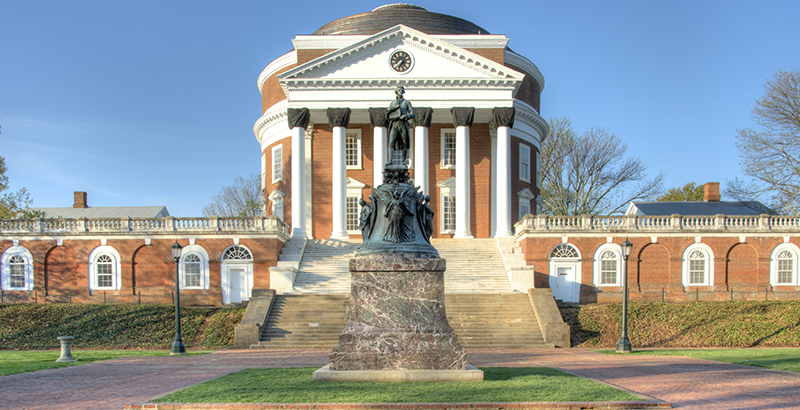 Touring the University of Virginia, you can’t miss the beautiful campus with its Jeffersonian architecture or the incredible opportunities available to students at this prestigious research university. What doesn’t catch your eye like the Rotunda or some of the modern, technology-rich classrooms are the stories of the individual students. Walking the grounds, you see a lot of put-together students who it’s easy to assume are all well-heeled. So collectively, we often get labeled as pretentious or rich in a way that obscures our different backgrounds. As a blonde, white female in a sea of students who look just like me, I want to say that not everyone fits this stereotype — and why that matters. I went to a high school with few resources in southern Virginia, and I am one of very few graduates from my school to attend any college at all. When I moved just before my freshman year of high school, I didn’t know what to expect. I knew that for the first time in my life, I was going to be a racial minority, but what I didn’t know was how different the college-going culture would be. The majority of students at my high school did not have college aspirations. Why would they? We didn’t have a full-time college counselor or access to much of the college-prep coursework, such as dual enrollment and advanced placement, that has become a staple in high schools around the country and around my state. Instead, many of us had to take these courses online if we chose to pursue them. At my high school, college was not on the horizon; it was something the students themselves had to prioritize. You don’t have to be an education expert to see the barriers that creates for students whose parents did not go to college. Going into my senior year, I knew I wanted to apply to UVA, but I never thought I would be accepted. At my high school, counselors and students alike would tout that “only one student from here can get accepted to UVA per year — that has been the norm since 1995.” Hearing that, I felt I had to come to terms with the reality that I wouldn’t be accepted. As I wasn’t native to the community, I was actually encouraged not to apply, to increase the likelihood of another specific student’s acceptance. Against that advice and those headwinds, I applied. And when I was accepted, I gleefully took my acceptance letter to my counselor to have my name read over the school loudspeaker. It was the custom at the school to applaud college-bound students and encourage others, to list all students’ college acceptances during morning announcements. In my head, I could hear it: “Sierra Leickert — accepted to the University of Virginia.” But the response was not what I had expected. My counselor was shocked and, instead of congratulating me, immediately asked me about the other student they had all expected to be accepted over me. Still, I knew it was the right choice, and the first time I set foot on the UVA campus, I absolutely fell in love. I felt there was nowhere quite like it — from the research and extracurricular opportunities to the academic rigor, UVA had everything I was looking for. I moved into my first-year dorm excited about the four years to come but quickly found myself feeling isolated. My hallmates and new friends would speak of the groups from home who had matriculated with them at UVA, and of the flexibility in their schedules thanks to the credits they had already earned because of the opportunities at their high schools. The majority of them came from affluent backgrounds, with parents who had gone to college. I, on the other hand, was all alone. There were two of us from my high school, and we were not prepared in the same way. I thought, “I am already behind; I am behind in college before it has even started.” I was embarrassed to tell people I was a first-generation college student surviving on institutional financial aid. Despite these challenges, I fought back. I worked three part-time jobs as an undergraduate, studied, found my niche through extracurricular involvement, and graduated with a bachelor of science in education, as a double major in youth and social innovation, and psychology. I stayed in Charlottesville to immediately begin work on a master’s degree that I will finish this spring. You would not know any of this just from looking at me. I take care of myself and present the same way as more-advantaged students do. But my story is different — and if we want to make a dent in the problems of social mobility in this country, my story and the story of students like me is important. I make a point of returning to my high school to talk to students about their educational goals and encourage them to apply to higher education. But that’s not a systemic solution. Our public universities have to do more to make sure they’re not merely credentialing factories for the already advantaged, and that they are instead actively building pipelines for students from high schools like mine, composed of large numbers of minority and low-income students, struggling with accreditation, and stuck with low college enrollment. Policymakers should take steps to ensure this happens. People say they want to address inequality and social mobility. That starts with appreciating the complicated stories of students, even at our most affluent schools, and making sure there are more students from low-income backgrounds at our elite schools — especially our elite public schools. Sierra Leickert is a graduate of the University of Virginia and is completing a master’s degree in public policy at UVA this spring. She plans to teach next fall.